If you have a flickr account and are signed in, you can favorite the photos you like by clicking on the star icon. You do not, however, have to have a flickr account to use the photos in your blog posts. You can select the code for the image size that you want. I usually use the small image with a width of 240 for the top of my blog posts. Click in the box of code to highlight it and then copy it. In your post, paste the code that you just copied and the image will appear. 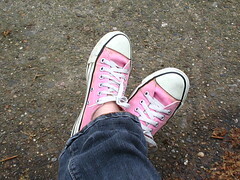 The following is one of my own photos that I used for this example (and yes, those are my feet and my dirty pink sneakers). I also add code to align and frame the image. I also add nofollow code to the link to the flickr image. Where do you get the photos that you use for your blog posts? Do you embed them or do you upload them. I generally use my own photos, but, on occasion, I do use creative commons Flickr photos, though most of the time I upload them onto my server, with a link back to the original on Flickr and proper attribution. I don’t use “nofollow” and use a plugin to strip it from comments on my blogs. I have yet to see any adverse consequences of using it. I’m uncertain on the nofollow issue but some believe that if links are followed that you could be leaking page rank to other sites. Great article, that’s easy to follow. I think it’s important that people who use pictures from Flickr understand the creative commons license and don’t abuse it. It’s a very important aspect, and it’s good to see it being included. Hi Nigel – Thank you for visiting and commenting. I generally upload the pictures because I want to use a different size than the standard sizes available on Flickr. For some reason I thought you were required to embed the photos from flickr and weren’t supposed to upload them. Not sure where I got that idea. I was using istock because I thought it was better to pay the photographer, if only a tiny tiny bit, but a photographer friend told me that many of those microstock photo places were ripping off photographers, so now I use flickr whenever possible. It’s not always possible, but I try there first. I never use nofollow, too much trouble! Ok – off to test my scripts. It is extremely likely that I just made that “rule” up in my head. You might have noticed I am prone to such things. I am very thankful that people are willing to let us bloggers use their images just for credit! OK, this is great, but how do you use Lightbox effects with this? uploaded and not embedded images? This is useful! Thanks! I use Flickr and I upload the photos. I rarely use photos and when i do i just google search for something not copyright protected at all… this is a very nice post though i thought you would either google or use zemanta… i was wrong as it turns out :) nice post there Kim! Yeh, Flickr is where I get most of my images as well. As for searching and adding images, I use the Photo Dropper plugin. It does exactly what you’ve done above, but it enables you to do it from the post-editing window of your blog. However, lately I’ve started hosting all images on my own site for fear that Flickr will slow down my site if it is sluggish or down… It also enables me to create custom sizes like Mike mentioned. Shirley´s last blog post – Is Video The Future Of Blogging? the number of plugins I was using. I have found a plugin recently which can search and embed the photos with creative commons license and also ad the credit link automatically but the searching algorithm is not good , it searches only 5 photos in one batch and some photos are not very relevant, than I revert back to doing it manually, it seems your way is better. Hi – Was it photo dropper? Most of my photography I host on Flickr, that way the photos can generate traffic from Flickr to my blog. Plus I do not have to use the space for the high res photos on my hosting account. things – not beautiful ones like yours. Hi Kim – I use Flickr and upload my photos. I was just looking at your #7 tip and when I go to Flickr, I do not see the code. What am I doing wrong? Well, that’s pretty cool to know how to do it legit. more than the actual content. to use tags that cover everything the article is about. should listen to your instructions a little bit better. I have never tried embedding a Flickr photo :) Usually my blog posts are pretty bland in that aspect as I use my own edited images… Usually these images are just text or with minimal graphics which is my own ‘poor attempt’ or cut pasted and collaged from elsewhere. I however, try not to use licensed images. This post is really comprehensive and would certainly help people to start using stock images from Flickr. The search screen is from Flickr’s advanced search. And I like the images you use for your posts – they tend to illustrate the topic really well. Ahhh, I’ve been putting in new words for each post according to what the post was about. So I should rather put in, like, the same keywords, what I think my blog is most likely about each time I post in that SEO box? That’s interesting that your site name has been around longer than you’ve had it. Had someone abandoned the domain name or something? And I am willing to bet it is your content that makes youso successful. Just a hunch. Hi Jannie – Oh – I’ve owned this domain name for about 10 years. I used to use it for more personal sites – a blog about my daughter, wedding photos and a sort of link blog called ‘on the bomb’. None of those sites were popular and it wasn’t what I created them for but I just think the age of the domain helps with the Alexa rank. I have finally come around and started nofollowing flickr images. I am using the photo dropper plugin, and to automate everything, I have edited the js file. Btw, Flickr has just recently implemented nofollowing all outgoing links,this is relevant for people who have profiles and accounts there. There is only one thing that still leaves me wondering… and that is the lack of control when embedding images. A couple of times, I have come across a couple of sites with the dreaded “Image not available” field, from Flickr. This can happen especially on older posts… If the user decides to delete the image or the account, we have no control over it. in which case, I do see the greater advantage of uploading the image, rather than embedding. Hi Palma – I didn’t know about flickr’s new policy. Thank kind of stinks. I always think it’s a bit of sour grapes when a site with great page and Alexa rank does something like that. And I didn’t even consider the flickr photos being removed by the account holder. So, that’s definitely a reason to upload them instead. But it’s so true that embedding them is quicker and easier. Yup definitely gonna integrate this. A picture makes your post look 10 times more interactive actually. Hi Ben – Great! I look forward to seeing photos in your articles. Brilliant again! You just saved me getting a new camera for now. Thanks, Kim! I haven’t been able to get my camera software to get along with this laptop running Vista. Now that I am blogging again, I need photos. Of course, I should have known who to ask all along. But thanks for being there when I wasn’t thinking about your expertise! As always, your directions are easy. I haven’t read all the comments but I did make it through getting a Flickr account and getting my first image tied to the blog post, only I didn’t find the code so I uploaded the image. me and didn’t think of it when I wrote the article. I need to update the article. Why would you use nofollow link for a pic you’re using? i think that usink dofollow link would be some form of compensation to the author – you use his image and his work gets little higher in search engines and stuff. Or is there another reason for using nofollow I’m not aware of? not the author. Some think that following links leaks your own page rank – if that is true flickr certainly doesn’t need any of my page rank. the link to it nofollow. Thanks for the tip. I have never embedded flickr photos. Will do it soon. Hi Nihar – Great! Hope it helps. That would be cool info to get about the keyword usuage / tips. “on the bomb” I can only begin to imagine what wonderments that site might’ve brightened the world with. Off to see your Flickr now. Jannie Funster´s last blog post – Seriously Weird! 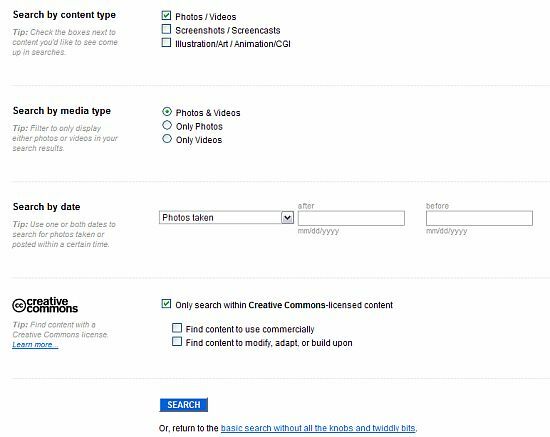 In my opinion, uploading Flickr images is legitimate use under Creative Commons. Hi Hardeep – I think it’s a legitimate use as long as you give the proper credit when they are used. Hi Brad – Thanks for the recommendation. Are the results accurate? I’ve used the Calais service before but I don’t really like needing an API key from a 3rd party. Yes you need the API, but I have had absolutely no problems with any Calais product and I use them on more than 100 sites. The results are very accurate with Tagaroo. I also use the calais archive tagger about once a month to go through and add new semantic tags to old posts. This keeps does really well at keeping old posts new in google’s mind. Thanks! I couldn’t remember the name of the other Calais plugin. There are a couple of others, but I wasn’t impressed enough to remember their names. I found you WAYYYY too wait in life, but am glad I did! Great tutorial! .-= Rick Castellini´s last blog ..Microsoft and Yahoo ink 10 year deal =-. You have built up very quickly then! I’ve been at it for nearly 13 years and have less traffic than you do! .-= Rick Castellini´s last blog ..Email of the Week – 013 =-. i am not technical at all and need help! i have no idea where to embed the code on wp. i can’t make the picture appear. by no means do i want to take a pic without due credit. please help! Hi Olga – You might need to switch to the html editor to paste it in. You paste it into the area where you write your post. 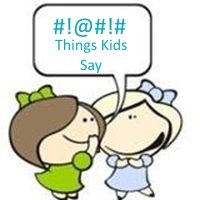 Hi Kim – Found your blog while looking for info on sticky posts. Then I came across this post about Flickr. We recently developed an easy to use plugin called Slickr Flickr. – it’s here if you’d like to take a look. Hi Liz – Thanks for the info. I’ll have to try it out. Kim, I just read your blog post here. 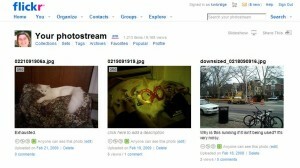 I have a wordpress account and I have inserted pictures from my Flickr account to it in the past. But I can no longer find a way to do this. Maybe it’s because Flickr or wordpress changed? I’ve tried inserting what is given as HTML code and BB code and neither of them work – they just show up as the code, a load of numbers and letters. It is very frustrating for me and I wonder if you could give any advice. Perhaps I could get an email alert if so, so that I would know to look at your web site again? 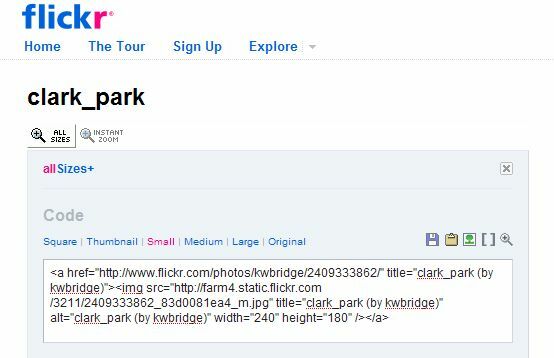 Hi Joe – If you add the link to the flickr image in the post, WordPress should translate it to an embedded image. ps: I think I have rediscovered how to insert the photos. I think the key is to have WordPress on its HTML setting, not its ‘Visual’ setting, when you insert the HTML. I did it that way and ‘preview changes’ and it seemed to work.